July | 2013 | Where's Merrill? As many schoolchildren prepare to start their long summer holidays at this time of year, no doubt collected from the school gates in their parents’ large 4-wheel drive vehicles and comfortable people carriers, few could possibly envisage what school life was like for their great-grandparents and even older ancestors. 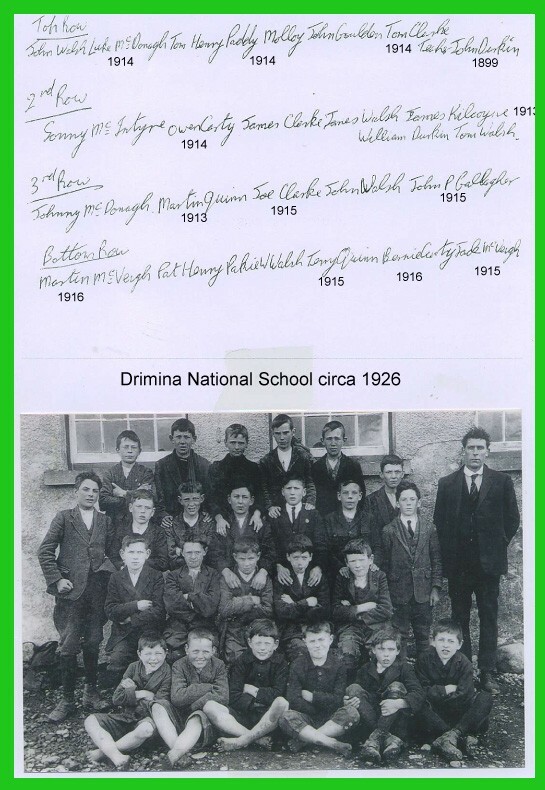 The following photo from the 1920’s taken outside the school my father attended in the west of Ireland provides a few insights. It is the earliest group photo I have come across from my ancestral heartland which portrays “ordinary” people, as opposed to local dignitaries dressed in all their finery. First off, you will note that the boys were segregated from the girls. The Roman Catholic church governed the vast majority of rural schools in Ireland for decades until quite recently, and the parish ministers must have feared that seating growing lads alongside delicate lasses would engender temptations which were forbidden until much later in life (and only after marriage, of course). The older boys in the photo would have been in the senior school year and aged 13 or 14. Shortly after this end of term snapshot was taken, these senior boys would have been thrust into the big, wide world to fend for a living. For most, this would have simply meant working on their father’s farms until approaching age 20 when mammy might permit her son to board a boat, and sail off to a faraway country, possibly never ever to return. Dad could have had a more pragmatic view. His small farming income could not sustain the feeding of too many hungry adult mouths. It was better that the grown-up kids left home at the first opportunity, so long as they sent some cash gifts “home” to Ireland in the years before finding their own marriage partners. Besides, the next oldest progeny would be ready to leave school, permanently, and take over the agricultural labouring duties of the departing emigre. But … the real shocker for today’s sports shoe-wearing youngsters is the clearly-visible evidence that many of their contemporaries from about 80 years ago had no footwear whatsoever during their schooldays. A decade after this photo was taken, my own father was walking bare-footed to this school from his remote hamlet a few miles away. So were all his school-friends. Of course, they protected their toughened feet by taking short cuts across fields and bogland, traversing streams as they went. However, the photo shows that the rough stone “playground” at Drimina must have caused sore heels and soles, especially when a very physical game of Gaelic football was organized by the young lads during intervals in between strictly-disciplined lessons.